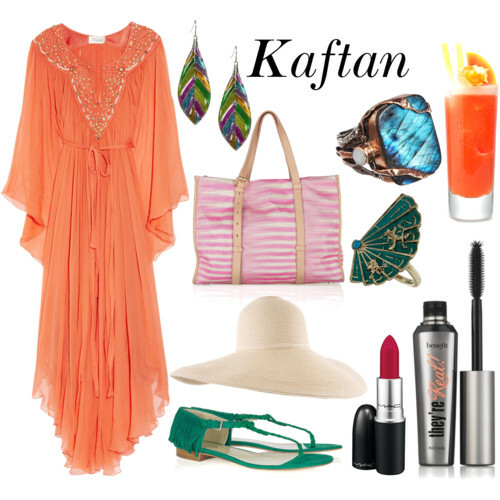 This weeks Polyvore challenge is Kaftan. I love kaftans and when I saw this beautiful kaftan dress I just had to have it in Polly's set. I teamed it with green sandals, some colourful rings, earrings, a Missoni beach bag and a large beach hat. I doubt Polly would ever wear this on the beach though. Maybe at the new Surf Club for a cocktail or two watching the hot surfers. Ooh. That is a gorgeous kaftan. Like you said, don't think Polly would wear it to the beach either. I haven't ever done a kaftan like that one before - it is gorgeous, I don't think it would suit my shape unfortunately. I adore it though, and give me those jade green slides and turquoise ring.